I used to love to draw pretty dresses, do a sketch up like fashion designers do; actually, I still enjoy doing that. My nieces love it also because I usually draw the dress then they color it in. #1 niece has a real sense of color. She also draws designs into the dresses. I tell you, the next generation never cease to amaze me. One of my most favorite shows of all time is Project Runway. I love the challenges that Tim Gunn and Heidi Klum think up for the contestants. It really gets my creative juices going. I'm in such admiration of the really good designers. Some garments that make it to the runway looks like trash and for some strange reason, Michael Kors, Nina Garcia, and Heidi Klum adore them. My sense of style that differs from theirs at times and sometimes we are in sync. I like bold. I like classic. I like clean lines and curves. What were thinking with these dresses? My fashion, over the years, is still a work in progress. I remember that the dress I wore to my freshman banquet was hideous. The color was ridiculously "pepto-bismol-ish" and the cut was not flattering to my body. Ugghhh... and my mother who desperately tried to help me pick a nicer cut was silenced by my headstrong-ness. I should have listened to her. Mauve taffeta? Ahh well, we live and learn. 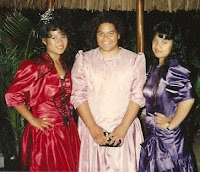 I am pictured in my mauveish-pink taffeta with two of my dear friends. This was after a night of dancing. 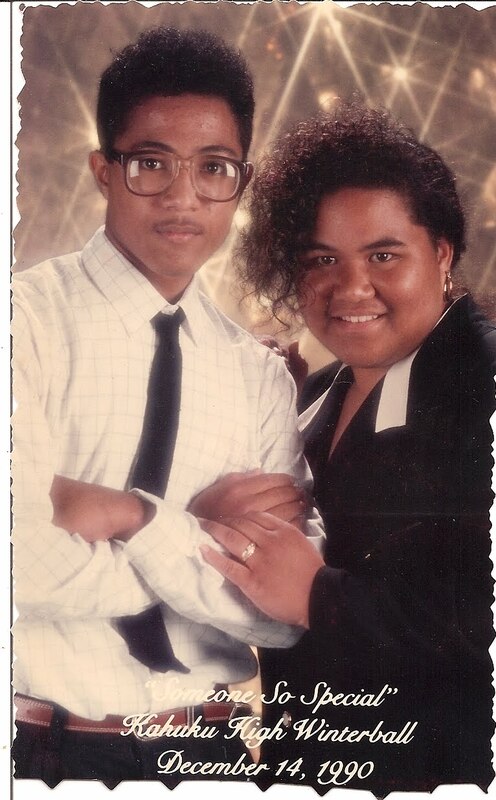 My cousin escorted me to the dance because my folks said I was too young to date. I also could not wear makeup. All I did with my hair is gel it. I'm glad I didn't do anything fancy because I danced all night long and I was soaking wet by the end of the evening. In fact, this picture was taken when the cleaning crew arrived. We were still hanging around, socializing, not wanting the night to end. So freshman banquet was in the spring. That summer I turned 15. By winterball, I had a date with a dear friend. I couldn't believe my parents let me go with him to the ball. We had a blast. He was such a gentleman. I seen him at our 10-year reunion, met his wife and daughter. I love that -- meeting up with old friends where EVERYTHING was perfect. Nothing happened between us that would be embarrassing for either of us. We're Facebook friends also. I should invite him to read this blog entry. Anyway... this picture I loved my outfit but look at my hair. I wore a classic black suit with white lapels and white and gold buttons. It was stunning! What's with the hair being combed all too one side? Was that the trend? I went through this phase where I would cut pants into shorts, roll the leg twice, no hem, and call it a day. Why I did that is BEYOND me. I think it's so funny to look back at what I thought was decent clothing. For instance... both pictures feature a jeans where I cut the legs out to a length just above the knee. I rolled up the leg into a cuff, no hem, and threw those shorts on. Oh, but before I even cut them (picture on the right) I had decided to throw some bleach on it to mimic the "acid-wash" look that my mother absolutely detested. 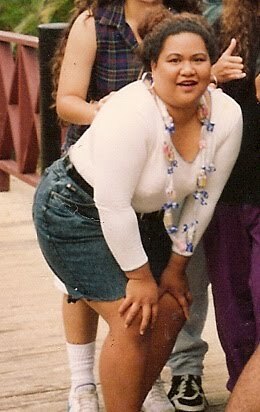 See... even back then I was a Project Runway candidate, designing my own bermuda shorts. I like the length of the shorts. Even now, this is the preferred length of my bottoms. Capris and Clam Diggers are alright but they tend to enhance my calves... which anyone who has seen me in person KNOW how large my calves are. Capris don't work as well as bermudas on me. Picture on the left... I had a bodysuit on (1994... that should explain everything!). Picture on the right... Adidas windbreaker -- don't know why I loved it but I did. I believe that was 1992. To summarize -- I'll never wear mauve taffeta again. I do like black suits and bermuda shorts. Classics! It's funny how I totally avoided the subject of what I wore today. I donned my work-out clothes all day long. After I took a jog this morning, the clothes stayed on while I did chores around the house. Never say never. I'm noticing the 80's style making a comeback. I thought you looked pretty trendy for the day!